Way back in 2008, a young gentleman by the name of Billy Mann got in contact with me via the internet and this rallying forum I frequent. He was planning on attending the West Virginia round of the Max-Attack championship in his VW and needed a co-driver. VW? Max-Attack? Sure, I'll fly out to the middle of West Virginia and help out! Well, long story short, his VW acted typically VW and blew up the engine. I was left with a plane ticket I couldn't use. However, I had purchased a cell phone for meeting him at the airport, so I guess you can credit Billy with convincing me to join the future. At any rate, Billy owed me a ride of sorts. 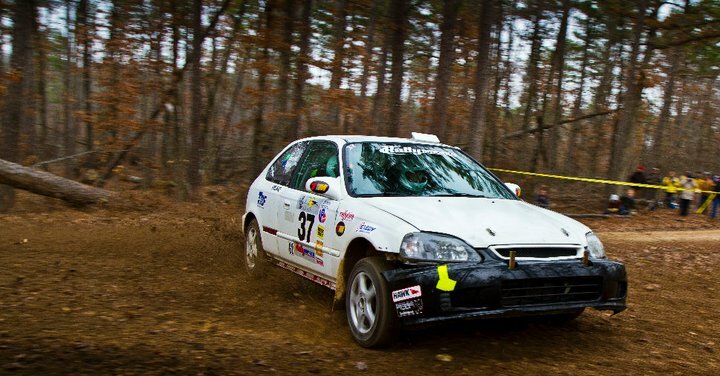 He invited me out to Missouri in 2011 to take a co-drive in his new Honda. We got along pretty well and his required style of notes didn't take too long to get used to, so it was a positive experience. Billy is getting fast and has a good crew, so he has a bright future ahead of him in the midwest. We ended up finishing 3rd in class and 8th overall on both days. I got to test out my GPS tracking device and get some Gp2 points for the season championship. After the rally, Brian Gottlieb let me take his rental car back, so I spent the day wandering around St. Louis. It was an awesome weekend adventure.